Which brings us to the final act, headliners Avenged Sevenfold. Quite possibly the biggest band in the genre, just ask their management. Actually, just ask their management anything, and you will probably be told a great big "NO" to whatever it is. At least that has been my response. In the past, they have denied any kind of press request, and today was no different. "Whatever", I told myself. After marching the entire herd of photographers, to the other side of the stage, to enter the photo pit (at managements demand...) we assembled, and readied ourselves for the oncoming show, which was now delayed by an issue with the curtain, that 3 people were working on. They actually looked like the Three Stooges for a minute, as you could see whatever the issue was, was getting very frustrating to them. Finally, the curtain parted (YAY!) and A7X came out blazing (literally, lots of pyrotechnics...) with a hot 12 song set, opening with the appropriately titled "Shepherd Of Fire", the first song on their latest release Hail To The King. 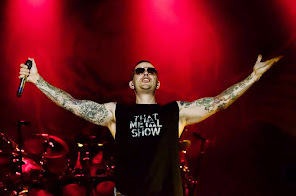 Again, lots of flames accompanied the bands stage set, and singer M Shadows paced the stage like a caged beast. He really is the show, addressing the crowd and leading them through their favorites, like "Nightmare" and "Bat Country". My issue with this band is not really the "handlers", as I alluded to earlier, it's their two lead guitarists Synyster Gates and Zacky Vengeance (those names still crack me up....) . Although both are very good players, onstage they look absolutely bored out of their skulls. Like this is the last place they would rather be. Not one word on the microphone to their legions of fans either. I have seen them quite a few times and it always puzzles me. Just a little enthusiasm onstage perhaps? The crowd, on the other hand, did not seem to care about that, and loved every minute. "Seize The Day" was a tribute to their friend and former drummer Jimmy "The Rev" Sullivan, who died a number of years ago., and it is still so fresh in their minds. By the time they encored with "A Little Piece Of Heaven" and the set closer "Unholy Confessions", it seemed like everyone of the sold out crowd was ready to call it a day. Avenged Sevenfold was like that last beer after a great summer vacation. We will leave it at that.